A simple utility for static pages maintenance. Why load the webserver with dynamic pages only to create menu at runtime, when the structure is predetermined at site upload time? 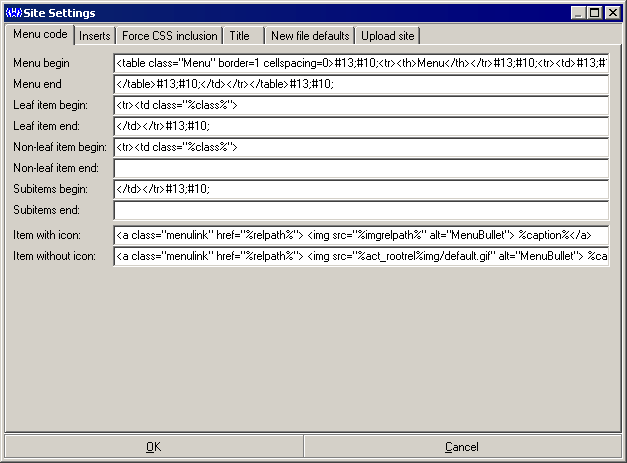 This program allows one to define a hierarchical menu and assign pages and links to each item. Then it manages the files used in the site - updates the menu in all pages. Actually this website is written with the help of WebComposer. This web (the static portion of it) has been created and is maintained using WebComposer. The main window shows the menu tree on the left and individual items on the right. 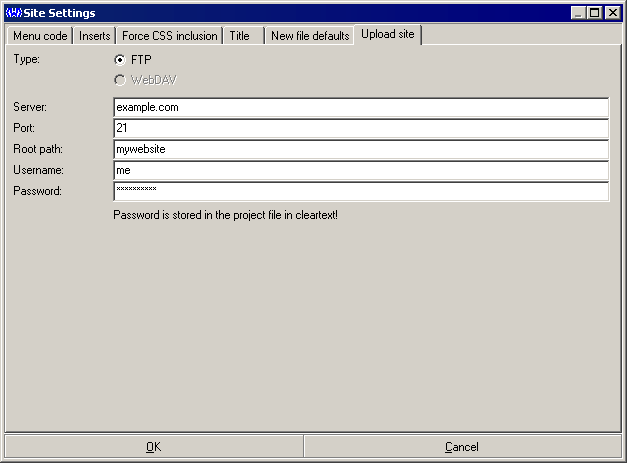 The items have basic properties: menu caption, filename, menu image and whether WebComposer is allowed to touch the item (Managed checkbox). You can also switch to HTML document view, displaying the HTML document, or the Source view, displaying (and editting) HTML source. Note about classes: Class is a generated string that identifies the menu level and whether the item is active or not. It is the concatenation of "menu", item's level (zero-based) and if the item is active, an "a". The resulting string is therefore "menu1", "menu2a" etc. This is an ideal way to integrate CSS with menu management. Inserts are another way to automate page building, by providing a way to insert common sections into the file. When processing each managed page, WebComposer looks for HTML comments that match the string <!--InsertName--> and <!--/InsertName--> (note the syntax, the first occurence is the insert's name, the second has an additional slash) and replaces everything in between those two comment tags with the insert InsertName. So in order to have a consistent footer in each site, only make sure every page contains a <!--MyFooter--> <!--/MyFooter--> pair and define the footer contents in the Inserts page of the Settings dialog. Also note that inserts support the same set of variables as menus, so at the very least you need to be careful with the percent sign (%). 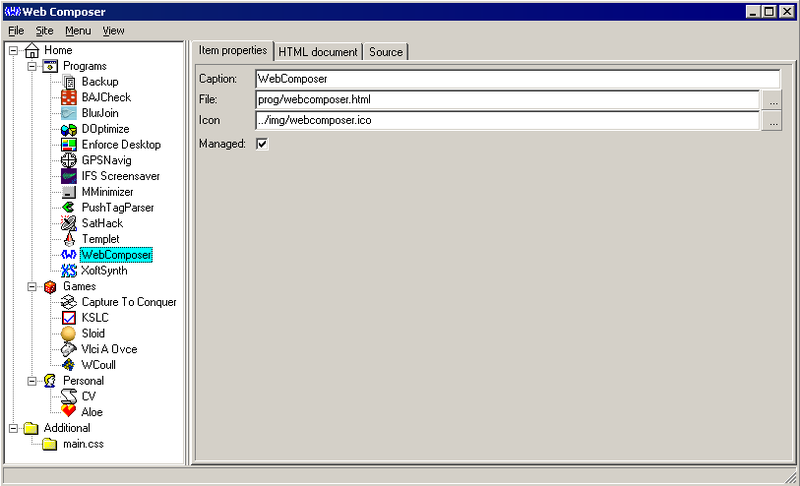 WebComposer can upload the whole site to a server using FTP. You just need to set the FTP server name, port (usually 21), root path, FTP username and password. Then use the menu Site -> Upload in the main window. WebComposer automatically detects local dependencies in the webpages, such as pictures and links to files, and uploads those files as well. If the FTP server supports it, WebComposer only uploads files that have been modified since the last upload, therefore saving uploading time and bandwidth. Version 1.1.0.20 2010_08_17 Fixed: HTML parser didn't recognize adjacent tags (caused some dependencies to be missed by the search algorithm). 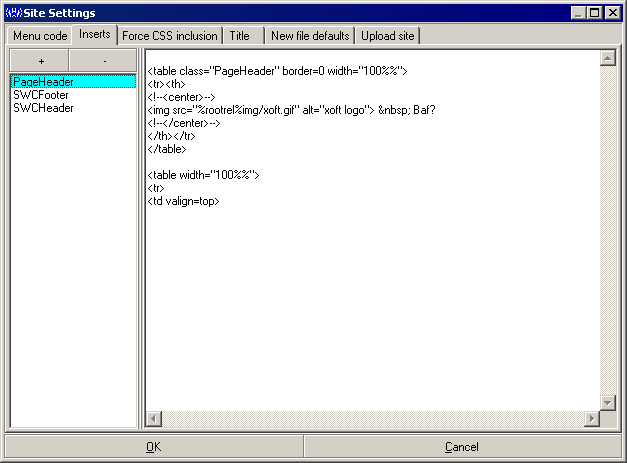 Fixed: HTML source editor didn't accept the Tab key, focus was shifted instead. Version 1.1.0.19 2010_08_15 Fixed: HTML header is not written into non-HTML files anymore.